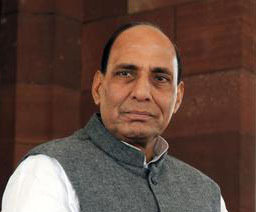 Union Home Minister Rajnath Singh has stated in the Lok Sabha on Monday that his Government and the BJP fully dissociates with the controversial statement of Jammu and Kashmir CM Mufti Mohammad Sayeed. The J & K CM had credited Pakistan and Hurriyat for the smooth conduct of Assembly polls in the state. The Home Minister further credited the Election Commission, the Army and the paramilitary forces as well as the people for the smooth conduct of polls in J&K. Not satisfied with the Home Minister’s statement, Congress staged a walkout from Lok Sabha. The party has demanded a statement from the Prime Minister on this issue.